I pulled up to the trailhead expecting my friends to be there, only to discover no one in sight. I looked down at my phone . . . no signal… “Welp this could be fun” I thought. 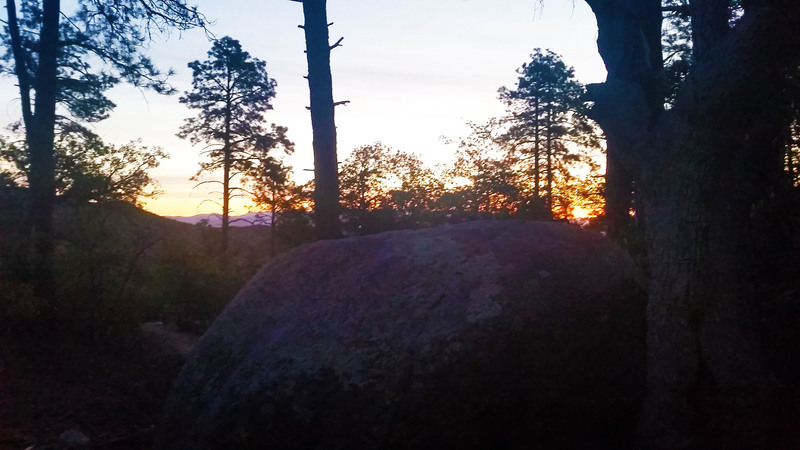 I was at the Metate trailhead of Granite Mountain, ready to take on a trek to a multi-pitch traditional (trad) route on one of the mountain’s slab granite faces. I took another circle around the park to check the other trailheads, just in case they had parked elsewhere, but no luck. It was a 10 minute drive out to catch a signal, but I figured they would have to show up sometime so I got on my mountain bike and tooled around on the road until their Toyota came bounding into sight. I was all smiles, excited to start the day! Craig, Eva, and Kari piled out of a 4Runner, bags in hand that were filled to the brim with harnesses, climbing shoes, helmets, a few ropes, quick draws, and of course Kari’s trad rack. We had a late start just around 11am, and as we let out Craig commented “as many times as I’ve gone trad climbing, I have never made it back to the trailhead before dark.” Well, it wouldn’t be my first night hike, and I could think of a lot worst places to be. We headed out with Eva claiming lead and the trail taking off in a north westerly direction. At first the trail dropped down into a canopy covered canyon, lush with green, and weaved in and out on the canyon floor. After a quick jaunt the canopy began to fade as we entered a large open burn area. 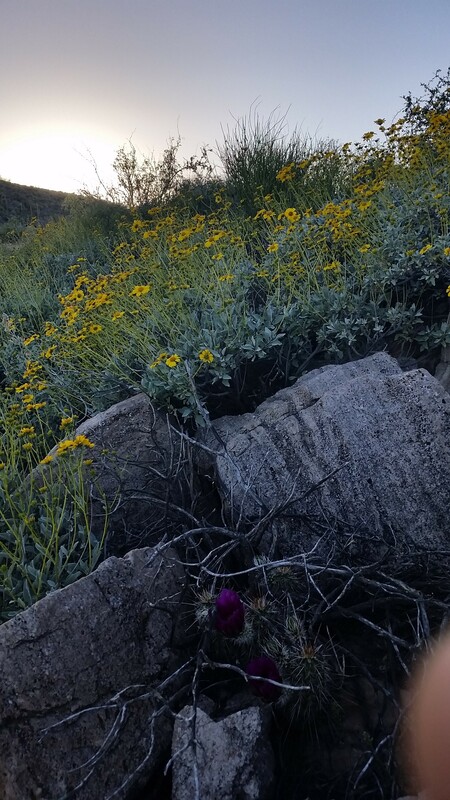 This time of year the brush and flower were celebrating the break of summer and covering the ground beneath the blackened and burned remains of the old trees. We finally reached Blair Pass, and beautiful views of the valley beyond and the rock face overhead where we intended to climb were in plain view. First clear view of the Swamp Slabs! Whew getting excited! We headed north from there, taking on the switchbacks of the trail and finally finding our first bit of gain. At the third switchback heading up the mountain our guide book instructed us to take the “climbers trail” east to the base of the Swamp Slabs where we would begin our climb. Let’s just say there wasn’t much of a “route” here. 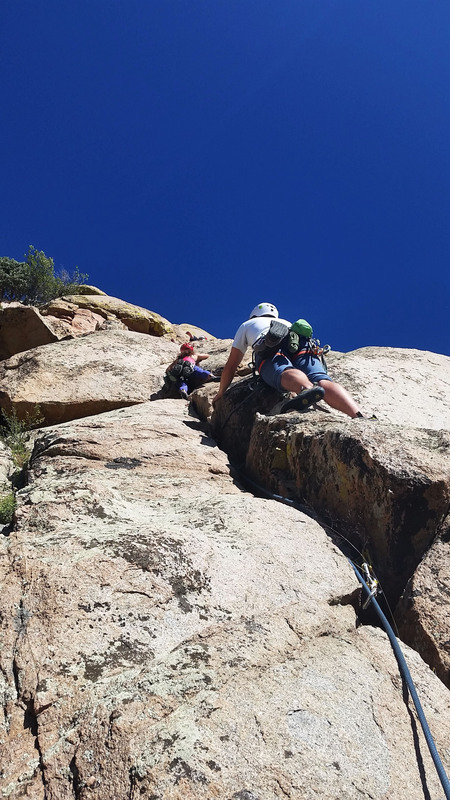 Accustomed to bushwhacking, we prepped and pushed forward, up the side of the mountain through brush, bush, cactus, and rocks until finally (with some sweat and scratches) made it to the base of the slab. Kari has been climbing trad for years and would lead. I could tell by a smirk on his face as he looked at the wall in front of us that he was ready to get started. Dislocation Direct was a 4 pitch 5.6 route (according to the book). We decided to go up the first pitch of Dislocation Buttress (5.4) and then skirt a ledge to start the climb just to warm up. We were told that many of the ratings here were sandbagged and not to be fooled by a low rating. At first Kari led while I followed, leaving all the tread gear in place. Then immediately after I began climbing, Craig would begin climbing and take lead on a rope tied to himself while Eva belayed from below. The first pitch was deceptively long and tougher than a 5.4 (in my opinion…but what do I know). Once getting off the ground and onto the face my hands were sweaty from searching for holds. I stuffed my feet into cracks when I could to cling to the rock like a lizard. Halfway up the pitch Kari’s trad was 3 feet to the right, far from the crack I was climbing. I re-positioned my feet, one in a crack and the other on the face, and stood. My right foot began to slip so I backed off. I took a second look to figure out what the heck he did and finally found a solution that worked, moving past the obstacle. Before long, after climbing through a few bushes and finally up and over an awkward headstone to a face, I reached the exposed ledge where Kari was waiting as my belay. Happy to see him, I clipped into the anchor he had created and took a nice rest while we waited for the others to join us. Soon Craig popped up right behind me, but after a few minutes he noticed Eva wasn’t climbing anymore and could have only been 15 feet off the ground. The cliffs had many ledges and crevices, restricting the line of sight to the climbers below from the belay station. We waited another minute, no movement . . . Worried something was wrong, Kari came off the anchor and went to the top of the pitch to repel down. It turned out a piece of gear had walked its way into a crack so far that Eva couldn’t retrieve it by hand and, not wanting to leave it behind, she was working to remove it. With a special tool, Kari removed the lodged gear and minutes later we were all at the anchor safe and sound. 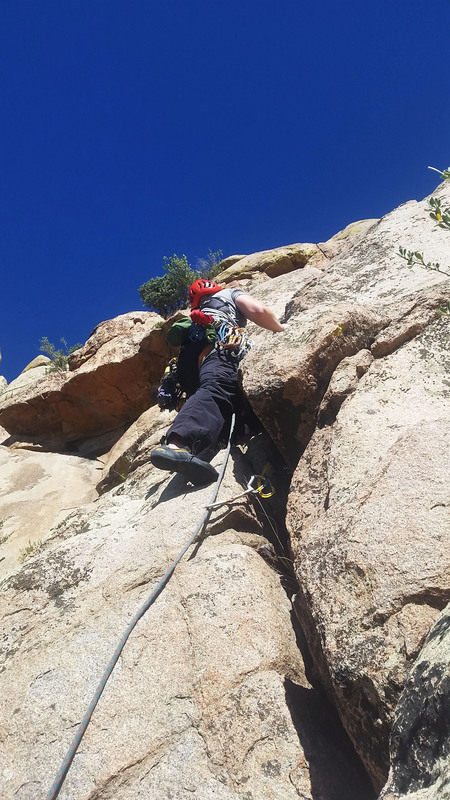 Due to the difficulty I volunteered to climb last, swapping out with Eva as I felt confident I could get anything loose if it were to get stuck again (I wanted to get some experience cleaning gear to see the placement). We climbed on, Kari leading and soon disappearing into the rock above. A few minutes later he called down that we were set having reached the next belay point, and Craig and Eva took off as I belayed Craig from below. It’s a strange feeling standing on a ledge while everyone else climbs above knowing that you have no other choice but to follow. Waiting, I listened for muffled yells from above that I was set to climb. The signal came at last; I threw on my pack and shoes, eager to get back at it. I began to climb and found that each pitch had a crux, a tough spot which took some extra effort to get by. The first pitch’s crux was just before the top, and there was a huge fin to the right which would have been a great hand hold. Kari said to heck with that easiness and went straight up a crack just to the left of the fin. The hand holds were small, the feet were smaller, and it took just the right balance to keep from falling. This was slab climbing, Kari’s favorite! I watched Eva and soon Craig pass on up to the belay station. I was could hear a grunt or two from Craig as he passed the crux, never a good sign as he is a much more skilled climber than me. I was up next, and it was time to shine (or crash and burn, whatever). 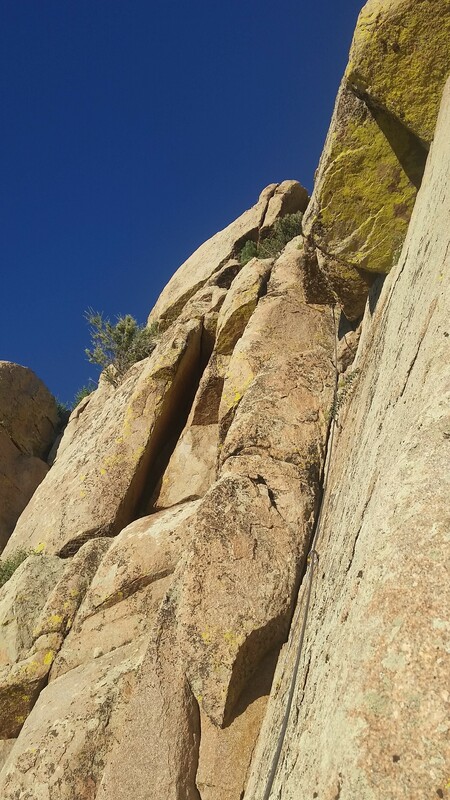 I got to the crux quickly and taking great care to maneuver the tight, small holds managed to surpass it and get to the ledge. “Whew!” I exclaimed at I clipped into the anchor. The sun was beaming down on us pretty good this late in the afternoon. We still had 3 more pitches to go and the sun wasn’t doing us any favors. This time Kari took on 2 pitches at once to make up for time and disappeared in the rock above. Soon Eva and Craig were gone too and once again it was my go. 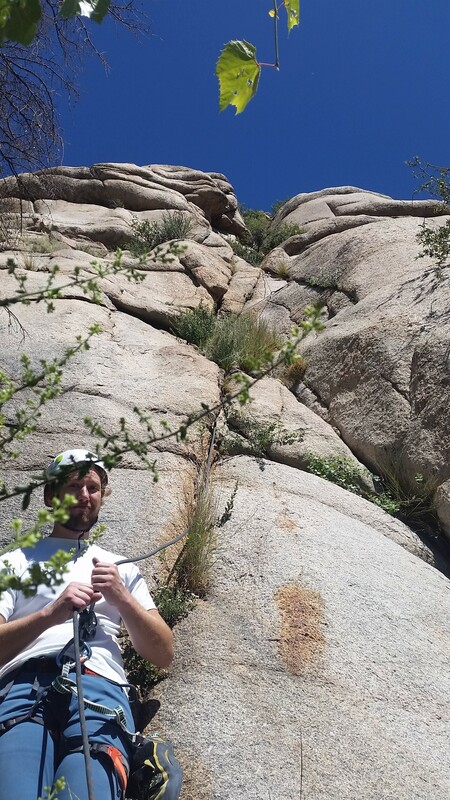 The first section was pretty straightforward and had some great holds. Just after clearing it I was staring at what seemed like a blank face, a huge left foot, and a large rock jutting out to create a small crack where Kari had left his gear. I approached and tried to orient my body for the high left . . . my foot began to slip and I backed off, grabbing for the jutting rock to hold me on the face. I tried again, nothing. And again, no success. I was starting to get frustrated looking at the face. I took a deep breath and approached one last time, hand on the jutting rock, fingers in the crack, right foot on a smear, and I pulled my left leg up from my crouched position for the big felt foot. Booya! Got it, but just barely! The rest of the climb on that pitch went smoothly from there. Climbing slab, cracks, and fins, grabbing trad gear as I went until I finally reached the ledge where everyone else was waiting. “That was spicy!” I exclaimed when I finally anchored in. We looked to the west, the sun was setting and we were still on the wall with just one pitch left. Kari, with gear over his shoulder looking like Rambo with ammo belts, headed up the last climb. He once again disappeared in the rocks above. Pushing up, up, up we all soon reached the top of the climb. 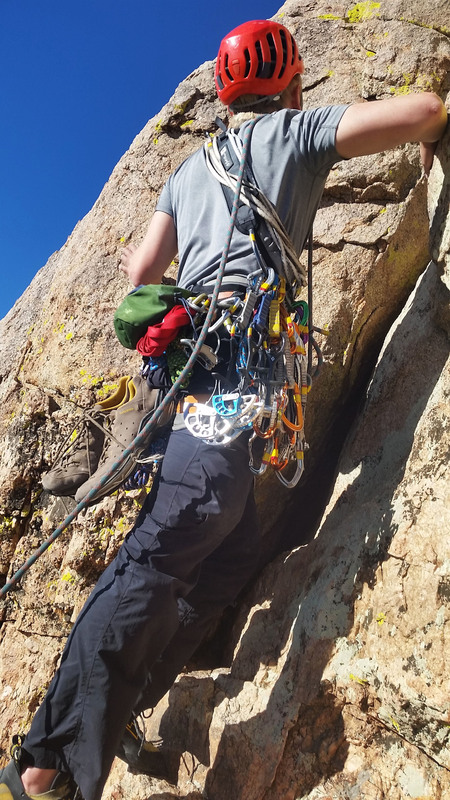 No chains to repel from here…nothing but you, the rock, and some trad gear. That’s pretty cool. Sunset glow from the top, find waldo . . i mean kari! The sunset was absolutely gorgeous. As we topped our climb, the sun was just dipping below the horizon. We all were happy to have finished and walked off the backside down a bushwhack gully back to our gear waiting below. By then it was time for headlamps, and we trekked down the climber “trail” in the dark until finally reaching the main trail again. 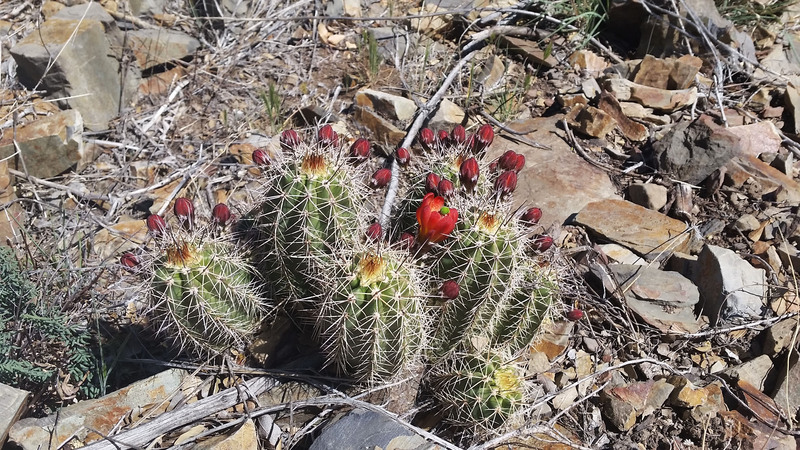 I won’t name names, but there were a few cactus encounters the definitely kept us alive and on our toes. We walked back down the trail by headlamp, all tired and happy to complete another journey. Of course Craig was right, it was long dark before we got back to the car, but aren’t those some of the best kinds of trips?! Oh sunset how awesome you are! Food: 1 Cliff bar, 1 bag trail mix, 1 apple, 2 protien bars, 1 bag of salt and venigar chips. I woke early, before the sun was up, and my eyes cracked open from my 10 hour slumber like Sleeping Beauty ready to start the day! 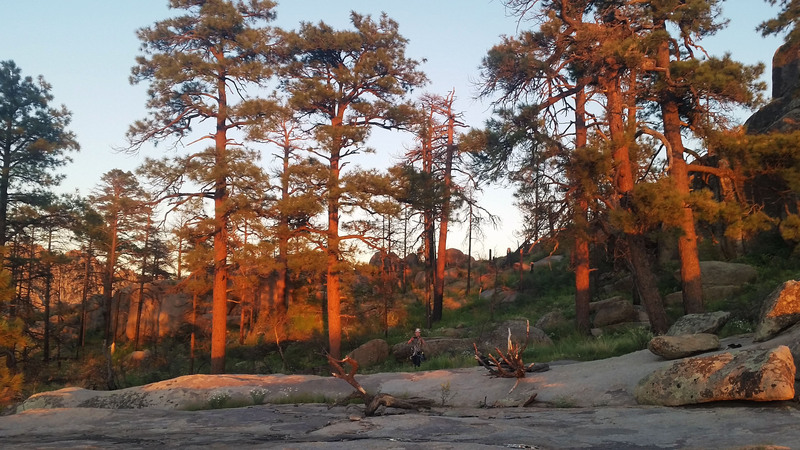 There’s something about backpacking…the sun goes down, you crawl in your tent after a long day and try to read and be productive, but instead you’re instantly drowsy and sleep seems to strike before your head even hits the pillow (for me at least). I went through the motions, making breakfast, packing up, and getting everything in my bag, before finally standing. I was in a personal race with the sun as some of my favorite times on the trail are just as it peeks over the horizon. The golden light bathes everything around you, illuminating rock faces making cool shadows, and snakes through the trees, giving some beautiful views that you can only capture for that brief moment before it’s gone. Sunrise and sunset are some of my favorite views on a trail. 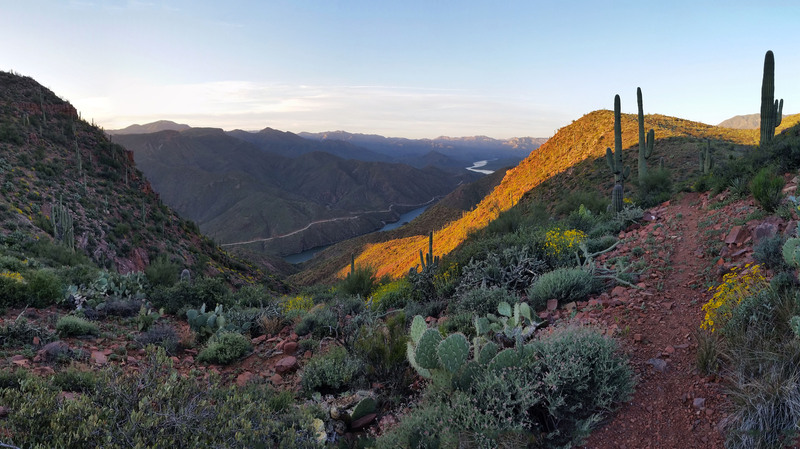 Strapped up, I stepped onto the dirt road where the AZT would wind and rise and fall for the next 11 miles before I would reach the trail cutoff to Kitty Joe Canyon and eventually my truck (hopefully still waiting for me un-vandalized and un-ticketed in the parking lot). With no idea what the day would hold for me, I headed out on my road walk. Not a soul was in sight, it was like the zombie apocalypse had happened while I was away and I was the last to know. Road walking gives you an opportunity to crank the pace wide open without worry, but it’s also one of my least favorite ways to hike. After 7 miles I took a break and had a quick snack on a rock, looking out the valley below. Just then I heard voices behind me…I turned quickly to see two hikers with big bags on their backs trudging my way. 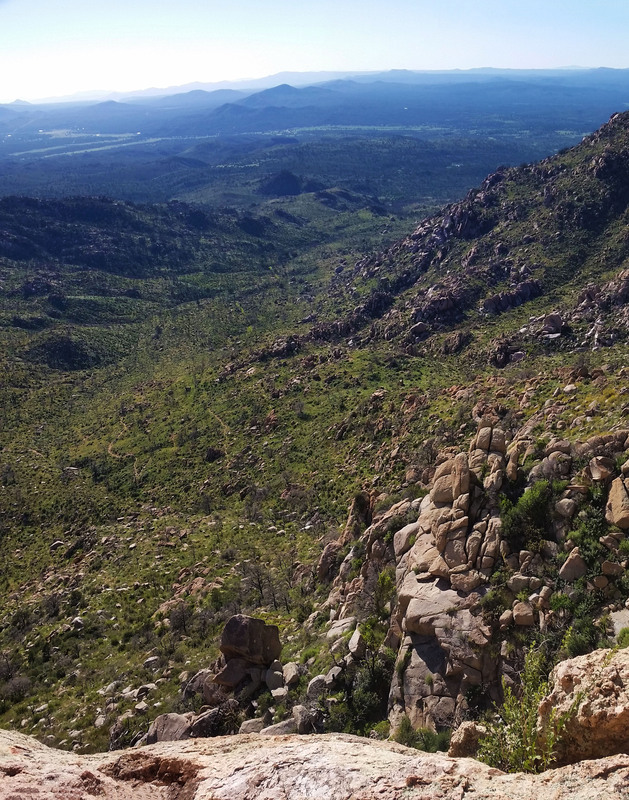 I stood on the rock, waved to the couple, and soon discovered that “Barking Spider” and “Stretch” were taking on the AZT in its entirety before continuing on to the PCT. Having not seen anyone for more than a day, I was glad for the company. It was both of their first times visiting AZ and they mentioned that they were blown away by the state’s diversity. They were on Day 21 of their trek and making great time. 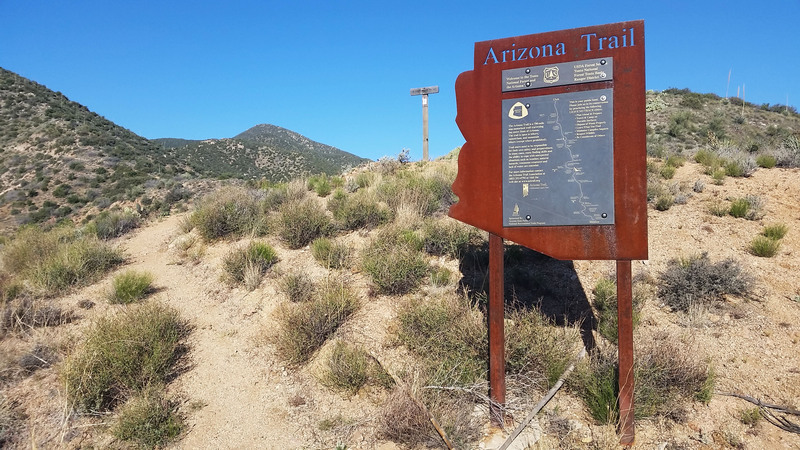 There are 43 sections for the AZT, each about 20 miles long, and their pace showed they could easily keep a solid 20 mile per day average going. We chatted about through hikes, saving up for the treks, working seasonal jobs, and of course AZ. “How about that water at Pigeon Springs?” Barking Spider asked. “Oh yeah, it wasn’t horrible, but I’ll take what I can get out here!” I responded. Apparently they had chosen the worse of the two troughs, not seeing the other, and got the blunt of the funk. All in good spirits, we kept trekking and the 11 mile slog quickly melted away. We made it to the cutoff and bombed down the canyon. I could see some old remains of a farm’s cattle watering trough in the distance. I snapped pictures as often as I could while trying to keep the pace going. Stretch held true to her name, man she could really move! At first glance you wouldn’t think it to look at her, but she took the lead and was quick as lightning, pushing a good 3.5 to 4 mph pace (this of course with a 20-30 lb pack on her back). We kept trekking until finally crossing a tributary to Boulder Creek. Here we parted ways as Stretch and Spider decided to take lunch and I pushed on. The cool creek was calling my name, but I wasn’t ready to rest yet, I wanted a few more miles under my belt. I kept pushing onward, up over into open plains. The sun once again began to beat on my head as I approached Boulder Creek, and this time I was ready to hang out for a few minutes. I pulled my bag off and plopped down on a nice big grey rock next to a deep pool in the sluggish creek. The longer I looked at it the more inviting it became. I was making great time and I figured what the heck, a little dip after 2 days in the middle of nowhere would do me some good. I stripped (almost) all the way down and jumped in. Whheeeewwww boy was it cold! Springs from snowmelt were undoubtedly feeding the creek and it was exactly what I needed to rejuvenate my spirits, cool off, and have a minute to soak the feet. This pool regenerated my soul! I pulled myself from the creek, threw my cloths and boots back on, and strapped up my bag again and before long was back on the trail. I was all smiles at this point, feeling refreshed and ready to close out the journey. I trekked on until I saw a figure in the distance. I figured it was one of the through hikers, but began to second-guess that conclusion as the hiker was alone. 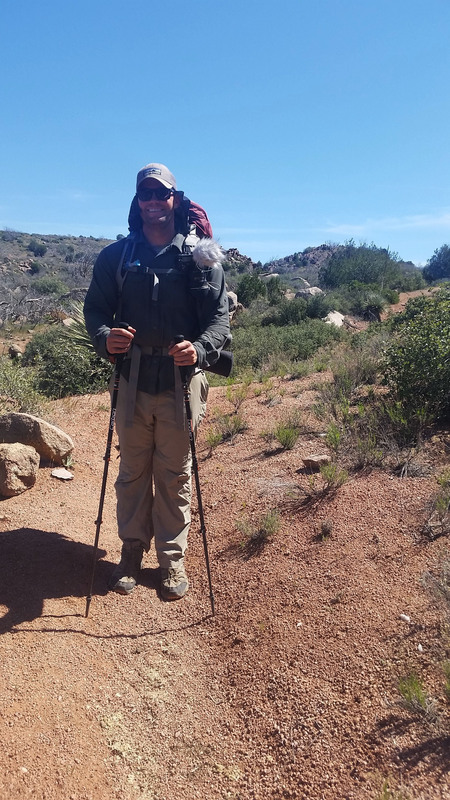 Catching up, it turned out to be another section hiker named Stephen Cox from Phoenix. He was a firefighter and was out for an extended weekend to take in the sights and make some nature videos. He was loaded down with gear, which all in all he told me he probably weighed 300 lbs between his own weight, the camera gear, and his backpacking gear. What a trooper! With my small frame I couldn’t imagine holding that much weight. We chatted for a while before I headed on, towards Sycamore creek and further on Highway 87 where my truck waited on me. I wasn’t in a hurry to finish but matching the pace of the two through hikers had gotten me into a rhythm. I crossed Sycamore Creek, lined with cottonwoods, and before I knew it the highway came into view. The end was within sight! I wasn’t ready for the day to be done, but I had already pushed this far and figured I might as well finish strong. 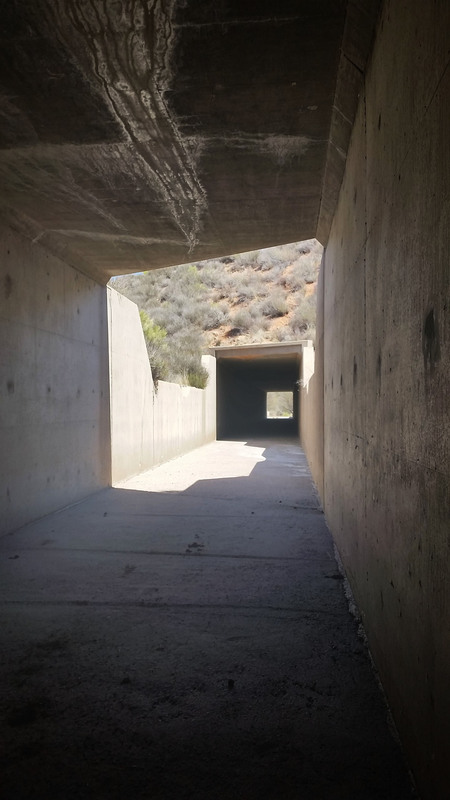 I hiked on until finally passing under the highway which marked the official finish to my Section of the AZT. I had recently completed Section 22 last year, and it was nice to be able to connect the two. I was dirty, smelly, and tired from the two day trek, but otherwise felt great as I approached my truck. Arizona is such a diverse and gorgeous place. 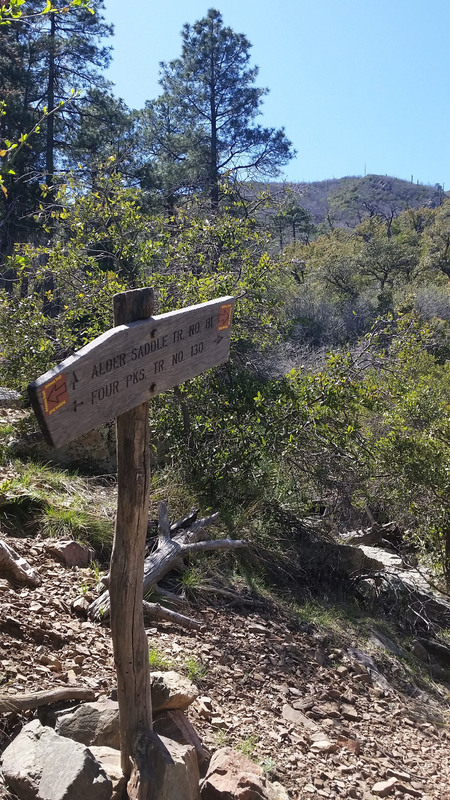 There is so much to see and experience out there, and there is no better way to see it than walking every inch on the AZT (even if you have to section hike it)! The Finish Line (for now)! ! Hello new friends, man they can move! Finally I can see the end and the road! Open road . . . oh wait im walking! Hmm wounder who that would be . . .
Food: 1 Power Bar, 1 Clif Builder Bar, 1 Granola Bar, 1 Protien bars, 1 Clif Bars, 1 Kind Bars, 1/2 bag of pringles, 1/2 bag of trail mix, 1 bag of Quinoa, 1 Oatmeal, 1/2 Avocado, 1 Pear, 1/2 bag of gummy worms, 2 bgas of Welches gummys, 1/2 bag of jerky, 1 Mountain House. Once again I found myself on a Friday post-work drive to a trailhead. This time my buddy Stevo was gracious enough to help me set up the shuttle trek which put me in position to take down two sections of the AZT in one weekend! The plan was to drive to Sunflower first and dump my truck. I would then hop in his car and we would circumvent the Four Peaks Wilderness back to “the Bridge” on the west side of Roosevelt Lake, where it feeds the Apache, Canyon, and Saguaro Lakes via the Salt River. All was going to plan as we pulled up to the trailhead just an hour before sunset. 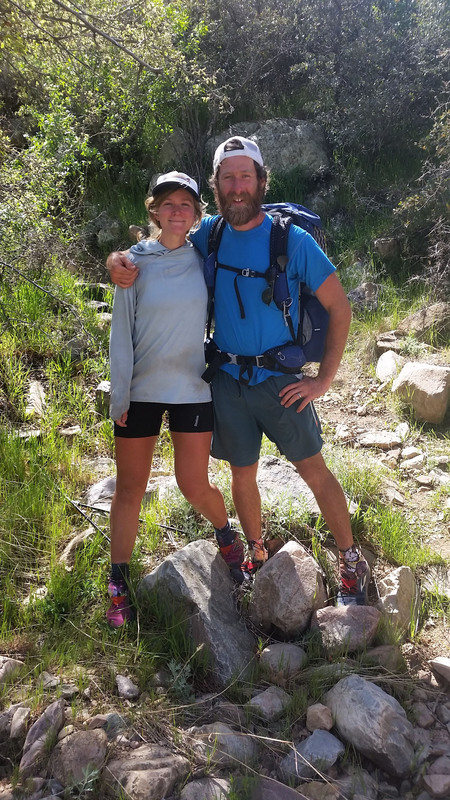 We said our farewells and I stood there, backpack heavy and trekking poles in hand, knowing I had no other choice but to trek 40 miles on the AZT back to my truck. It’s a funny feeling sometimes when you go backpacking, knowing you have to survive with only what is on your back. Funny, but also liberating! Vinyard 131, lets get to work! 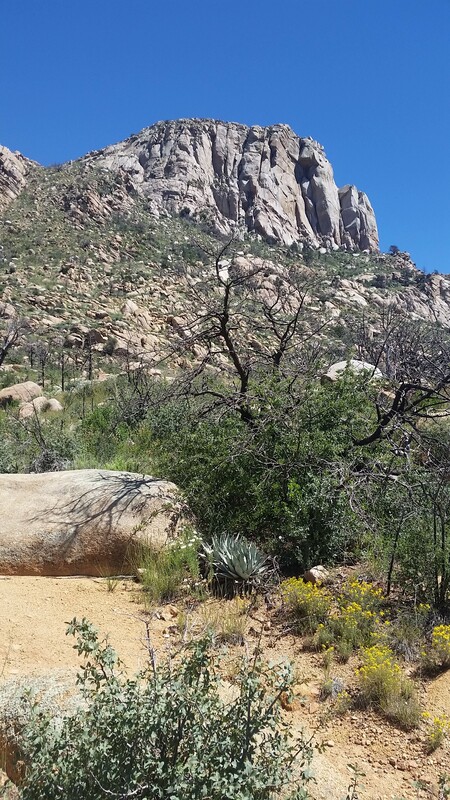 I took my first steps on the AZT at Vineyard Trail #131, anxious to get started. The trail took no time at all getting some quick gain up over the lake for some gorgeous sunset views. I pushed in just over a mile before I found a relatively flat spot just west of Vineyard Mountain (not much to choose from out here) to camp and plopped for the night. On the way I figured I would touch off on Inspiration Point to get a nice 360 degree view of the lake and mountains to come, totally worth the side trip! With the tent set up and camp made for the night, I watched the sun set over the lake. What a view! The alarm blasted in my ear, as usual, waking me from my peaceful slumber signaling the time to get moving! Packing up camp in a zombie-like state (its pretty much a brainless task from continued repetition at this point), before I knew it I was already throwing my pack on my back, ready to start the first of two 20 mile days. I pushed out and up a hill as the sun rose, and once again in regular fashion, it took no time to hit some good gain! The trail was lined with freshly blooming yellow flowers, and for a moment I started singing in my head “follow the yellow brick r….” Nope! I’m not going to have that song stuck in my head the rest of the day! I kept tracking on the Vineyard Trail not really knowing what to expect. 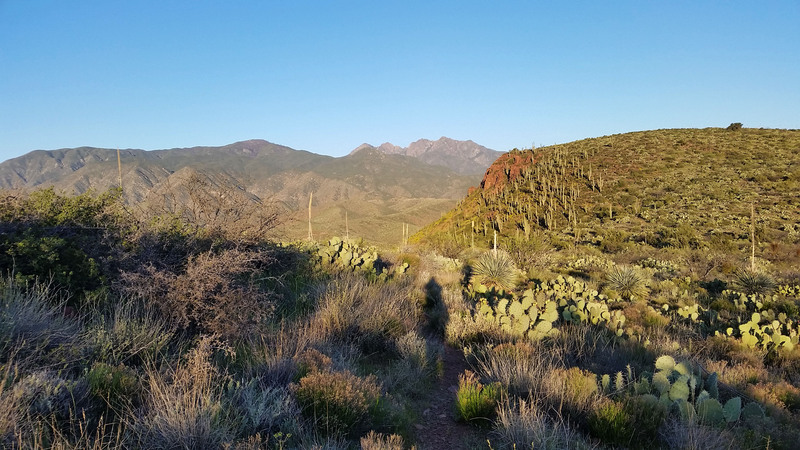 At first, the trail paralleled the Salt River, high above in the morning before taking a northerly sweep, until finally finding its way through the saguaros jetting up from the grass-fed landscape surrounding the trail. The trail was awesome and I had it all to myself! I kept trekking through the morning deeper into the desert, crossing open fields, and just taking in the views. 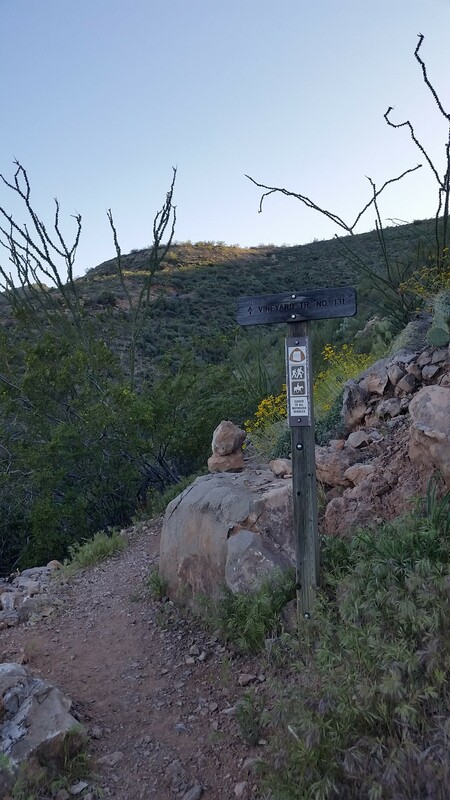 I came across a dirt road, which the AZT followed just briefly before springing back on its own single track. I hiked on, up and though the fields, stumbling upon wild plants, wildflowers, and the occasional wild life. 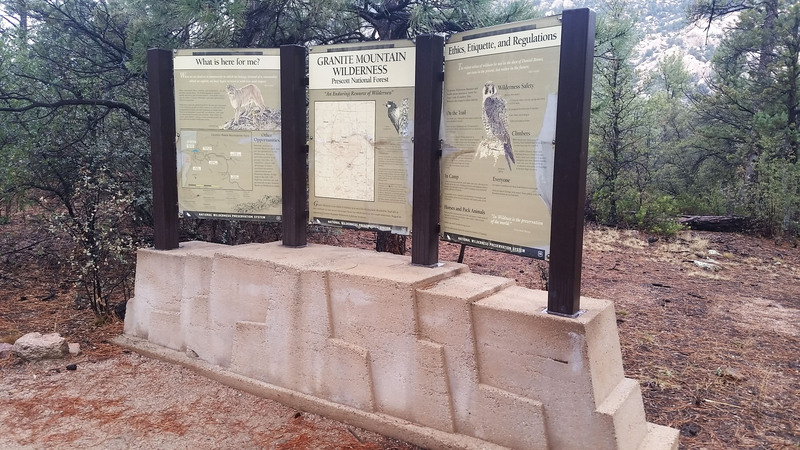 Once again I came upon a road, but this time it was a dead end and a large AZT sign stood next to the trailhead. 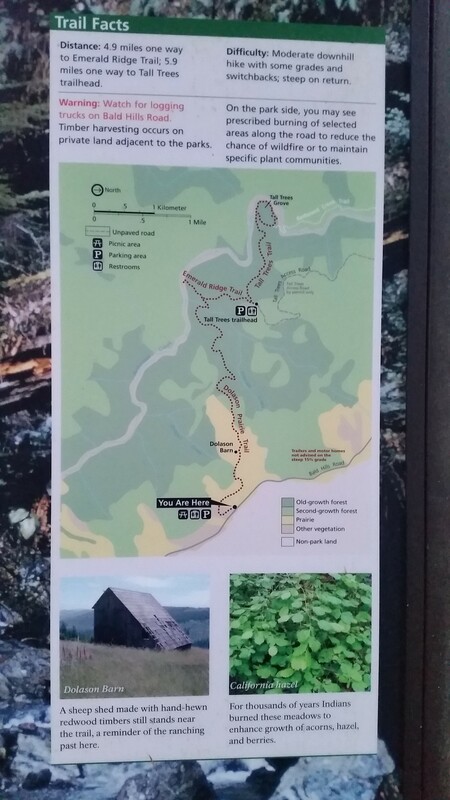 I had made it to Mills Ridge trailhead! By that time the sun had risen pretty high and the temps had started creeping up, which of course was just in time for the trail to take off in the vertical! 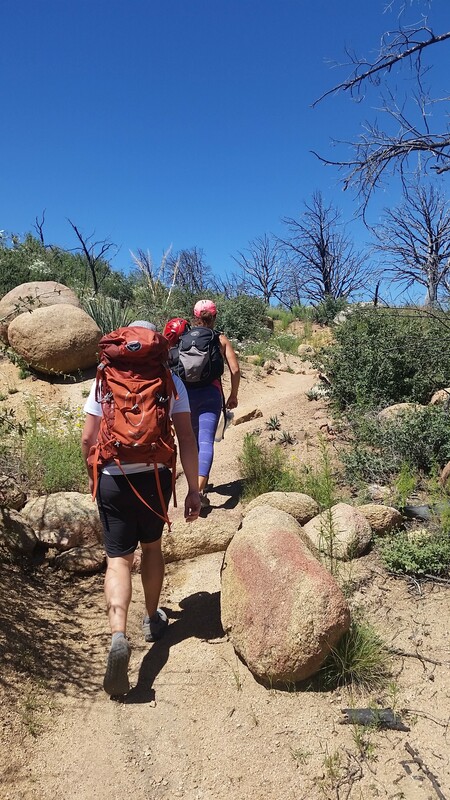 Up through high desert grass and Manzanita I pushed, my head down, fighting through the gain and the weight of the pack on my back. It couldn’t last forever, I knew, and finally the trail leveled off. I dropped down into a small canyon, finding a small flowing Buckhorn creek trickling by, and stopped for a much needed rest. My Target, from a far, 4 peaks! Listening to the cool creek trickle by made me forget about the sun beating down on my head as I opened a bag of Quinoa and began munching down. Snack time is always welcome on the trail, everything always seems to taste that much better when you are on a long haul. I knew I couldn’t sit there all day though, so I stood, threw my food back in my pack, and pushed up the next ridge. 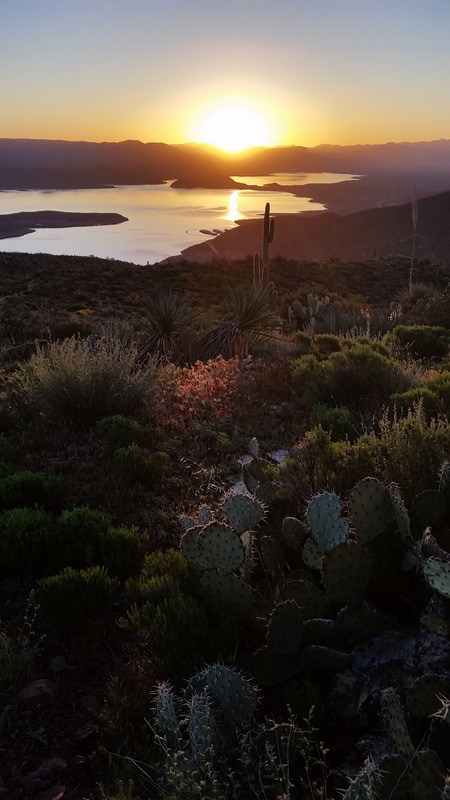 I caught glimpses of Roosevelt Lake as a hit a few switchbacks, it seemed so far away now. 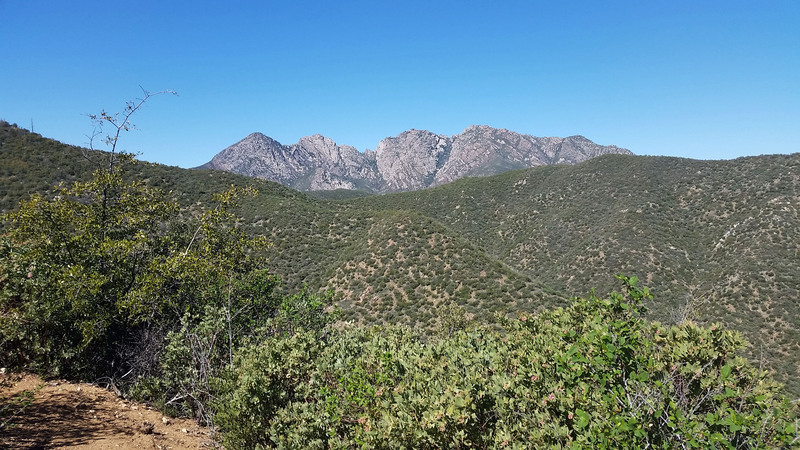 I popped up over another ridge and saw my first real sights of Four Peaks. They were poking out from the hills ahead as though it were playing peek-a-boo. All I thought was “I’m coming for you fellas!”. I was up in the best of the Manzanita at this point, skirting the mountains, not another soul in sight. I turned a corner and saw pines and it put a big grin on my face! I was getting closer to my goal and I decided to take another quick break. Looking up, I watched a few screeching eagles circling back and forth overhead. I figured there must have been a nest nearby, and I continued to rest in the shade of the pines. Being outside all day by yourself brings you to a good calm place, and sometimes you need to disconnect with civilization and reconnect with nature. It was go time once again. I passed Black Bear Saddle, grey rock jetting up from the surrounding Manzanita, and started skirting the back side of the peaks. The trail was tight and hardly traveled, and the drop-off became more severe as I got closer to the peaks. After rounding a corner, I hit trees again and an open grass meadow. I knew I was getting closer to the end of the day’s journey. Trekking along, tired from the day, I crossed a few rolling creeks. Shake Spring was rolling well and Bear Spring had a nice trickle. As I reached Pigeon Springs though, I wished that I had filtered at one of the previous two as Pigeon wasn’t flowing. It was barely a dribble, two murky concrete troughs that had bugs, leaves, and god knows what else swimming around. I had trekked too far to go back, though, so I selected the lesser of the two evils and filtered. 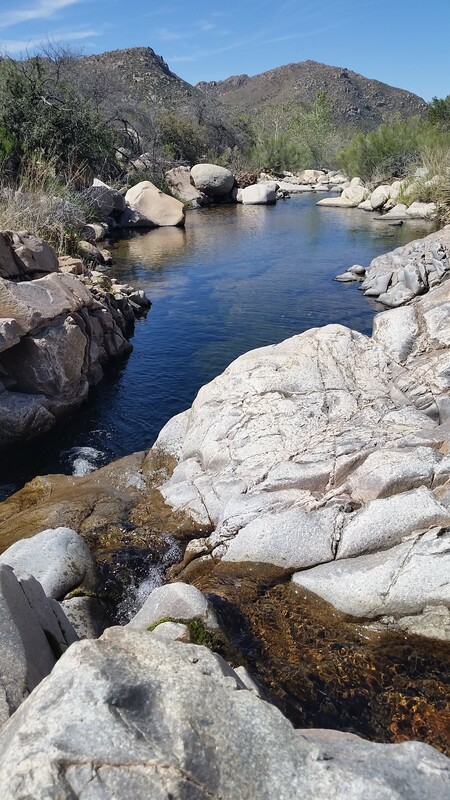 That “tasty” flavor came through a little bit, but flowing water in Arizona is hard to come by and I was grateful to get what I could! I set up camp just a half mile up from the spring. I didn’t want to be right next to a water source just in case some wildlife came in late for a sip. Exhausted, I fixed up a mountain house and had a small fire in a nearby pit. I didn’t see a soul all day, and I couldn’t have been happier. I bedded down after my meal and crashed like a tranquilized wildebeest. It was a long day, but the trip was only half over. 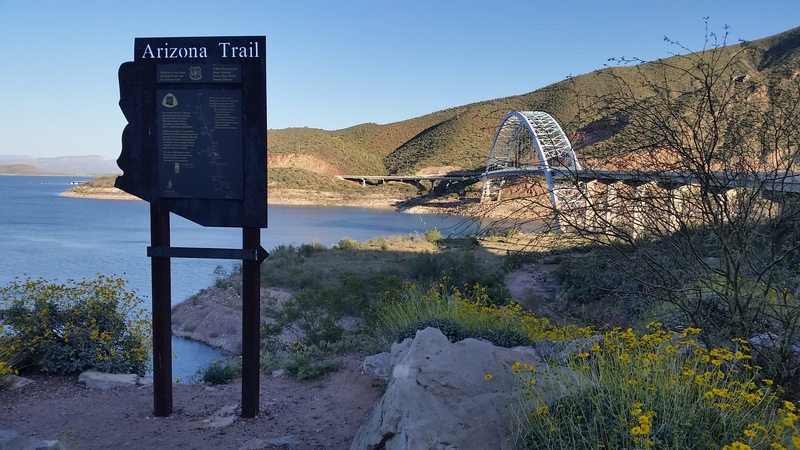 I love Arizona, and the Arizona Trail is a great way to really experience what it has to offer. Oh Sunrise, how awesome you are! Get get moving, lots of trail left to cover! Just peeking over the horizon is one of the 4 peaks! Wierd bean looking things, was cool to see! Screaming eagle high, circling my head! Getting into high dester and into some trees! The road leading the the Pigeon Springs trailhead.